What Does Eating Too Many Cherries Cause? The chance of suffering any type of side effect from eating cherries is slim, as long as you're not allergic. But overconsumption raises some red flags. On the positive side, cherries provide iron, potassium, vitamin C and antioxidant phytochemicals. They're also good sources of fiber and carbohydrates, so they can boost your energy while adding beneficial fiber to your diet. Cherries contain enough fiber and carbs to cause problems if you eat too many, however. It sounds strange to say that a healthy fruit may provide too many calories, but it's true if you eat an excessive number of cherries. 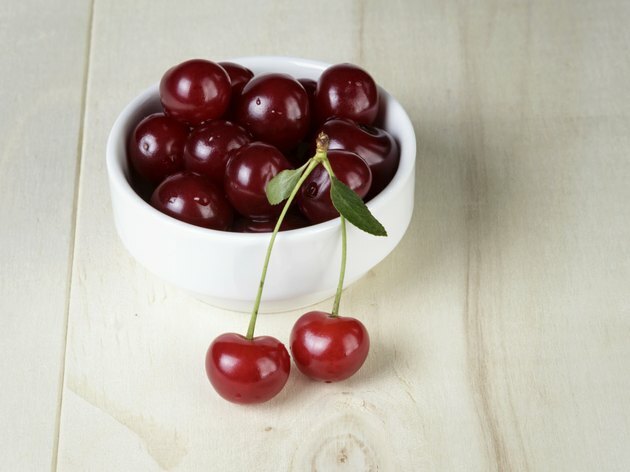 One cup of sweet cherries contains 97 calories, which is low enough to make this serving size a good choice for snacks. What seems like a reasonable number of calories will quickly add up, however, if you don't pay attention to the amount you eat. Be sure to include cherries as part of your regular daily calories. Adding 97 calories on top of a diet that already fills your calorie needs will contribute to weight gain. One cup of cherries has 3 grams of fiber, or 12 percent of the daily value, based on eating 2,000 calories a day. If you eat a large portion of cherries, the amount of fiber you'll consume can cause side effects such as bloating, gas and diarrhea. This is more likely to happen if you're not used to eating fiber. You can reduce the risk of side effects by increasing fiber gradually, which gives your digestive tract time to adjust. Women should consume 25 grams of fiber daily, while men need 38 grams, according to the Institute of Medicine. The U.S. Department of Agriculture recommends consuming 1.5 cups to 2 cups of fruit every day. If you use cherries to meet that goal, or if you simply eat a lot of cherries, you'll also consume a significant amount of carbohydrates. Two cups of cherries contain 50 grams of total carbohydrates, or 17 percent of the daily value for carbs, based on a 2,000-calorie-a-day diet. The carbs in cherries consist of fiber and sugar. In addition to consuming double the fiber, eating 2 cups of cherries means you'll consume 40 grams of sugar. The fiber helps prevent a spike in blood sugar, but if you get more sugar than your body needs for energy, it will be stored as fat. Cherries contain proteins that cause allergies in some people. If you're allergic to cherries, you can't eat any amount without suffering a reaction, which may include shortness of breath, swallowing problems, hives, nausea or diarrhea. Consuming either a few cherries or a large amount can result in life-threatening symptoms such as difficulty breathing and low blood pressure. People who are allergic to grapes, apples, peaches, apricots or hazelnuts may also have an allergy to cherries, reports the American Academy of Allergy, Asthma and Immunology. U.S. Department of Agriculture: How Much Fruit Is Needed Daily? Do Strawberries Give You Gas?